Even if you have never heard of the word “turmeric”, you are certainly already familiar with this rich and flavourful spice which is a common ingredient in many Indian curries and in a North African tagine. This is the key ingredient that gives these dishes their rich yellow colour and some of their intense aroma and flavour. 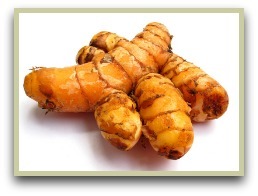 Turmeric (Curcuma longa) has been used in traditional Ayurvedic medicine for thousands of years. The key ingredient it contains is curcumin. Recent research has shown that curcumin has anti-microbial properties which can boost your immune system and help fight off bacteria. There are now studies being done to test its effectiveness in boosting the power of chemotherapy, while reducing some of the uncomfortable side effects. There are many, many more! Click here to read about some of these. It is part of the ginger family which is native to South Asia. Today, most of the world’s supply still comes from India and Pakistan, where it grows wild. The spice itself comes from the plant’s roots, which are boiled and then dried, before being ground into the deep yellow powder with a flavour generally described as earthy, buttery and slightly peppery. More info on the plant. 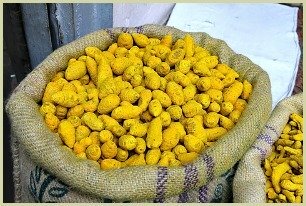 It is a principal ingredient in almost all curry powders and in South Asia it's also often used in beverages, cakes and other sweet dishes for colouring. It is also a common ingredient in Persian and African dishes. I recommend that you try and get hold of some fresh turmeric. Whilst the powder is excellent, the fresh stuff adds a really tasty, authentic flavour to your cooking. If you are in Asia, you'll find this root sold fresh everywhere. If you're in the West, you usually have to find a specialist shop or head to the Asian supermarket. Turmeric has been so valued in India over the centuries that it is used even to this day in religious ceremonies and weddings. ...the best answer to the question may come from your palate. Head out and try some tasty Indian or Moroccan dishes for yourself, so you can see the value in adding some to your diet. Sample some chicken tikka masala, some aloo gobi or some lovely lamb tagine, not just for your taste buds, but also for your health.